SNES Final Fantasy V (JPN) in 3:25:57.13 by samurai goroh. 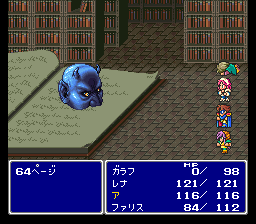 Final Fantasy V is probably the least known of the Final Fantasy series on the SNES, because it was never published in the USA (PS1 port and GBA remake aside). This movie plays through the game in under three and a half hours. We recommend reading the author’s comments regarding this movie to understand the manipulation used. Note: Because this game was never released in the USA (aside from the PS1 port and the GBA remake) and our rules regarding fan translations are a bit strict, all text in this movie is in Japanese.